At the American University Museum, patrons can embark on a mysterious visual journey that uses African cultural traditions and Voodoo-rooted beliefs in the spiritual attributes of plants and animals to examine the human condition. While this sounds exotic, the artist behind the exhibit has been a Washingtonian for over 30 years. Renée Stout created the alter ego Fatima Mayfield, fictitious herbalist/fortuneteller, as a way to role-play and confront various issues from love and money to darker social ills. The show includes intriguing, ethereal objects and tools of the trade for a high priestess. Stout, who calls her exhibit “Tales of the Conjure Woman,” describes it as another chapter in her ongoing exploration of the thoughts and adventures of Mayfield, a “mysterious seer and herbalist.” The exhibition includes approximately 50 works comprised of works from previous one-person shows that Stout has had at the D.C. gallery that represents her, Hemphill Fine Arts, as well as more recent works specifically done for this display. According to Stout, some people are drawn to her enigmatic works out of curiosity and a desire to open their minds and broaden their horizons through art. Others may feel suspicious or even repelled by the at-times taboo subject matter if they don’t have a full understanding of it. “People will filter what they are seeing through the lens of their own personal experiences and spiritual beliefs,” she said. 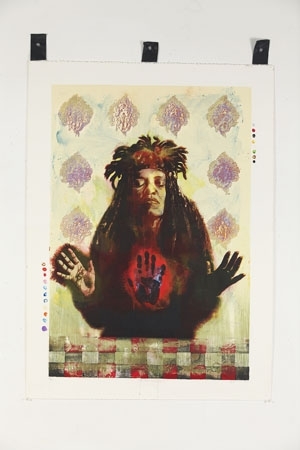 Stout was personally drawn to the subject as an African American woman who wanted to gain knowledge about the variety of African spiritual belief systems that manifest themselves in contemporary America, as well as the syncretic religions that have their seeds in those ancient beliefs. Stout is now in the process of starting a new body of work called “Funk Dreamscapes from the Invisible Parallel Universe,” in which her fictional character Mayfield communicates with the unseen world and offers visions from the portal through which she has traversed. In conjunction with “Tales of the Conjure Woman,” the exhibit “Circle of Friends” showcases the support network that female artists provide one another as they make their way toward artistic maturity and relevance — using these communities of support to examine the history of art in Washington. In addition to its winter shows, the AU Museum is celebrating the grand opening of its Alper Initiative for Washington Art, a new space on the museum’s first floor for exhibiting work by D.C. artists.